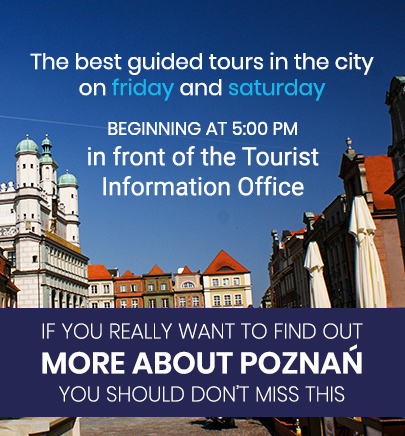 *We show groups around Poznań and Wielkapolska with guides speaking the following languages: English, German, Spanish, French, Italian and Russian. Non-standard languages service: Arabic, Chinese, Finnish, Dutch, Japanese, Serbo-Croatian, Turkish and Hungarian is provided depending on the availability of a guide. The price with non-standard language service is 20% higher than the standard foreign language service. ** Charge in the case that a guide begins or finishes work outside Poznań. *** For additional payment we also provide: hire of coaches and minibuses, guides with a car, audio guide system, reservations overnight accommodation, meals and entry tickets for our guests. The price is decided individually depending on the requirements and the availability of services. The prices given do not include entrance tickets to visited places. In the case of a group not coming or cancelling guided tour less than 24 hours prior to the ordered tour; the ordering client shall pay the cost of the guide’s fee for two hours.